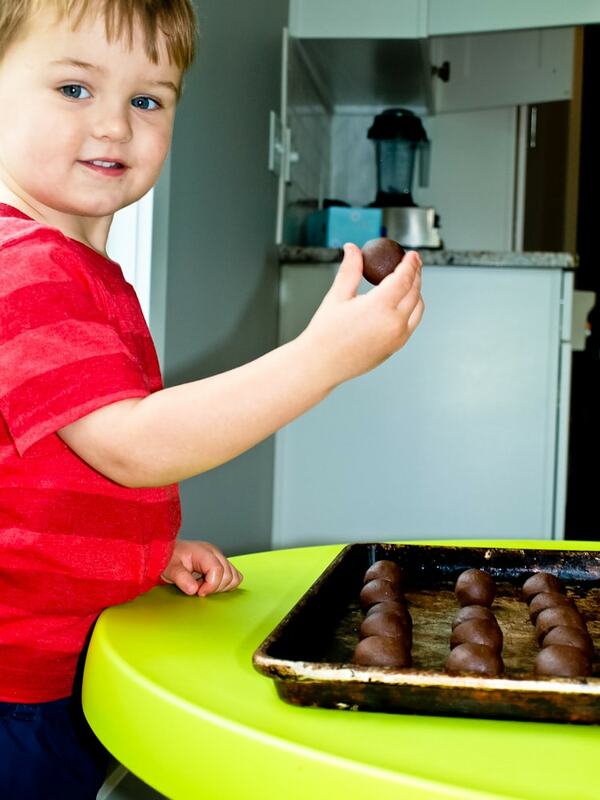 Chocolate Peanut Butter Energy Balls make a healthy snack your whole family will love! I have this thing with beans. I keep putting them in places they aren’t intended to be. Brownies? Sure. Cookies? Why not? The thing is, beans are awesome. Nutritionally, they are powerhouses. Seriously. Beans are a great source of protein, fiber, calcium, iron, and magnesium. All important nutrients of which I want to make sure my kids are getting enough. Why save them for dinner? 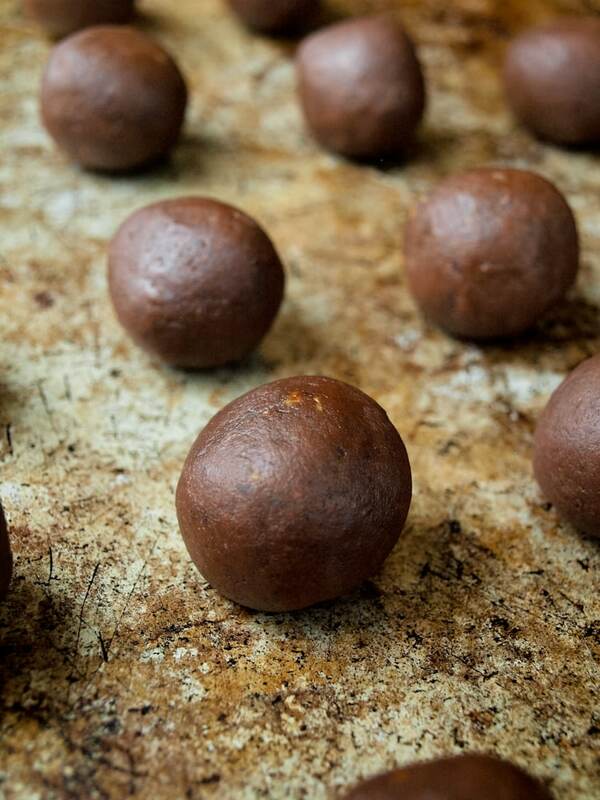 I promise you that you won’t know that these chocolate peanut butter energy balls have black beans as their base. Even if you don’t love beans. The inspiration for these came from my High Protein Energy Balls recipe that uses chickpeas as the base. Black beans were a natural swap and they worked beautifully. These chocolate peanut butter energy balls are the perfect snack for anyone, but they are especially great for kids. Healthy snacks are so important for growing kids, so why not choose a snack that will not only fill their bellies but also help fulfill their nutritional needs? The best part is my kids think they are having a treat when they are eating these. Low in calories, fat, and sugar, and high in fiber and protein. Yet it tastes like you are eating fudge! Well, almost. Yes, despite cutting sugar from my diet, I did try these. I can’t serve my children something I haven’t tried, right?! Although I probably could have just taken their word for it that they were good judging from their reactions. All I heard was “Yum! Yum! Yummmmy!” from both of them. If you have a food processor, these are super easy! By far, my favorite kitchen appliance. 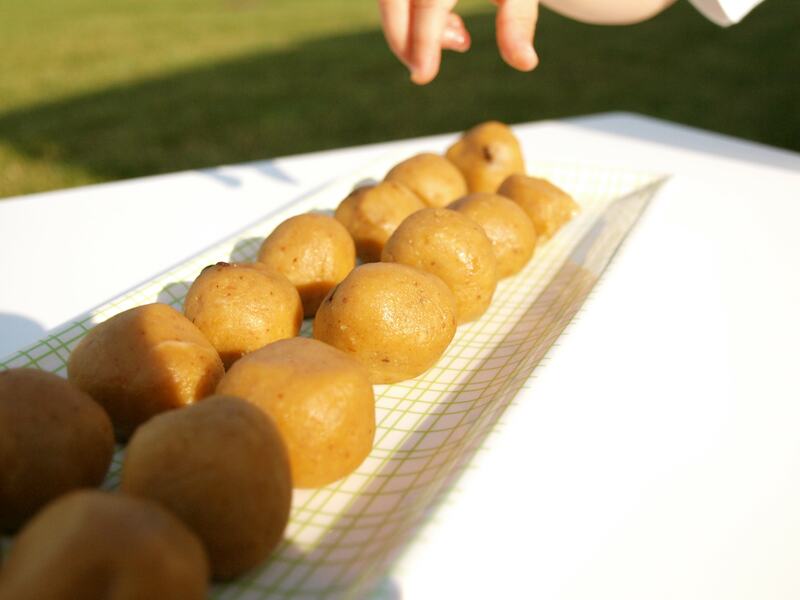 5 simple ingredients is all you need to create this kid-approved, healthy snack. 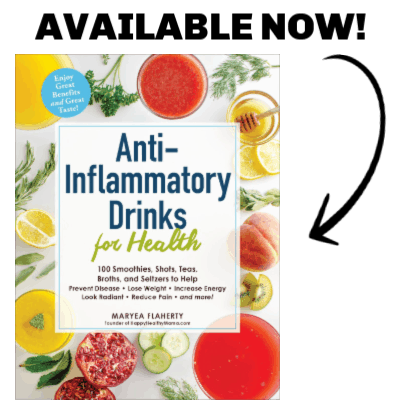 A perfect way to get an energy boost and satisfy that chocolate craving! In a food processor, process the almonds until they are a fine crumb. Add the beans and process until they are well incorporated. Add the peanut butter, honey, and cocoa powder and process until the mixture is smooth. Roll into balls and place on a baking sheet (lined with parchment paper if you prefer). These can be eaten right away, but I like to put them in the freezer for 10-20 minutes to help them firm up a bit first. Store in the refrigerator or freezer. Enjoy! The chickpea peanut butter energy balls have been a family favorite since I first made them three years ago. Remember when Meghan was stealing balls during the photo shoot? Seriously: where does the time go?! When I developed that recipe, I was pregnant with Luke. 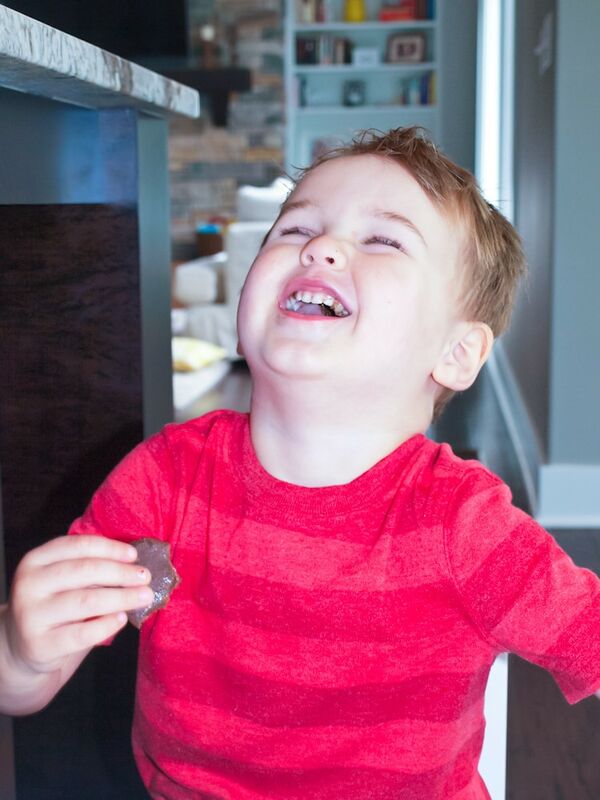 This time, Luke was the 2 year old and he decided it was his turn to be the energy ball thief. So funny! I hope you are having a great week and you get a chance to try this healthy snack recipe! We just made the chickpea peanut butter energy balls earlier this week. Still working on getting through the bag in the freezer. These are next! Thanks. I hope there will be some left when I get there, they look delicious. I am SO going to try these next week! They look delicious! Finally made these tonight as a snack to bring to work, but then I had one for dessert. They are tasty! The hubs loves the chocolate PB combo. I feel like the texture is a little weird at first but it grows on ya. Thanks for the recipe! These look great! I just got a food processor for Mother’s Day and I am excited to try these. Your life is going to change so much with that food processor! 😉 Can’t imagine not having my food processor. Hope you guys enjoy these. I’m assuming soy nut butter would work fine with these. Am I right? My daughter seems partial to soy nut butter. What beautiful children you have! 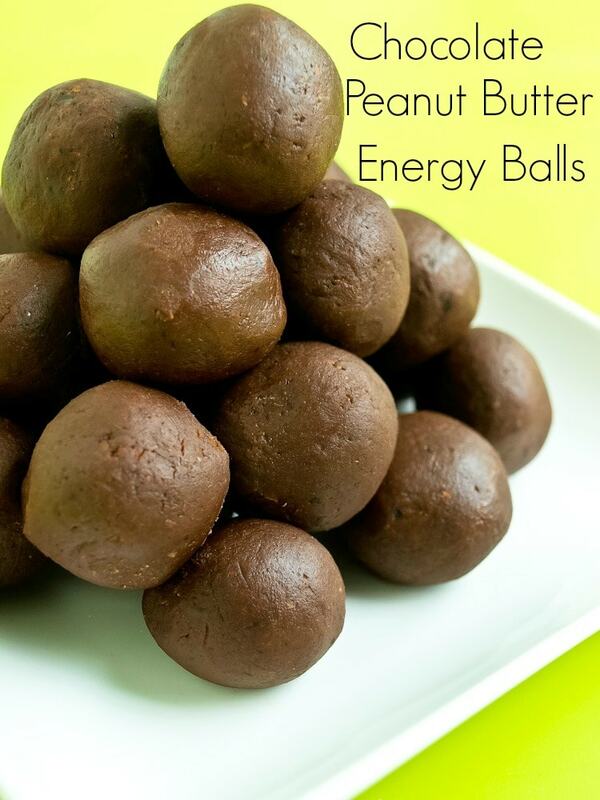 And these energy balls look so delicious and easy! I love using beans in treats! They work like magic. These look incredible. Must make these this weekend! Peanut butter chickpea also sounds amazing. Yum! I didn’t use a measured scoop but the balls were about 1 inch tall. this is a fun, healthy snack. I just made these to have as a quick afternoon snack and let me tell you they are scrumptious. Like brownie batter rolled into a ball. My daughter walked into the kitchen as I was rolling them and I got a “*GASP* thank you mom!” without even a taste. We love chocolate in this house, so I have a feeling these will be made again without a doubt. These are the best!! I made the raw “donut holes” from Barre this week and they’re almost gone so these are next. Beans in errthang!!! Genius! Thank you! Lily requested Nutella Balls so I just used the rest of a jar of raw hazelnut butter. Ironically it’s my son who can’t get enough. Thanks again! Hi Maryea! I just came across your blog when searching for new recipes! Looks like we have the same ideals about food and cook very similarly. I make a recipe very similar to this, but I’ve never tried black beans before, I like this twist a lot-adding some protein and fiber, great idea. I suppose standard can sizes are a little different here in Canada – my tin of beans was 19 oz instead of 15 oz. So… I just added a little extra cocoa and a little extra honey. And I had almond meal on hand, so I used that instead of grinding up whole almonds. So delicious! I love snacks like this that have nutritional value… and taste so wonderful that no one would ever guess 😉 . My doctor recommends I have a small high-in-protein snack in the evening and this might be just the thing. Thank you!! You’re welcome! So glad you enjoyed these. Yes, that should work just fine. Although I haven’t measured out the almonds after processing, I think 1/2 cup almond meal would be a safe bet. Please let me know how they work out with your changes! I did use 1/2 cup of almond meal and they turned out great. My 19 year old loves them as he is always looking for ways to get more protein in his diet since he lifts weights. I had to “mash” the beans with a fork and this worked good. I also added just a little more honey and used a little less cocao. I put the ingredients in an oven-safe bowl and put them in the oven on low for about 5 minutes to soften everything up so it would mix easier. Worked like a charm! Thank you for the great recipe! I just made these. Added 3/4tsp of almond extract. So Good!!! Thanks for the recipe!! I found these on Pinterest a week or two ago and finally made them tonight… amazing!! From my past experience making recipes using honey as a sweetener, I figured they would be a little bitter for my taste – so I added 1 and 1/2 capfuls of vanilla extract and a sprinkling of splenda -probably a table spoon or less? I should have measured of course… these are great tho! 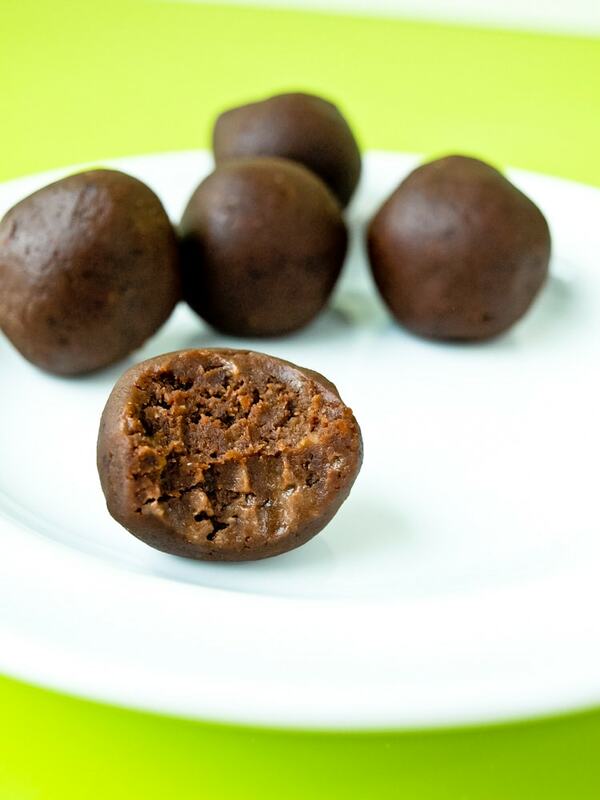 I’ve got them chilling in the freezer right now and they taste like brownie dough bites. So neat!! thanks for a great healthy recipe for a chocolate fix. I love that these use black beans. Most other recipes call for chickpeas! These look great! I haven’t tried using black beans in energy balls yet. If I was using almond meal instead of processing my own, how much do you think I should use? I would start with a little less than 1/2 cup. Then you can add more if you think you need it. Please let me know how they turn out! Can I sub oats in for almonds? I’m allergic to nuts (was already planning to use toasted soy butter instead of pb) Thanks! I think oats would work great! Will you let me know how it turns out? I’m glad to hear these were a hit! I am going to try pressing this recipe into a pan and topping with peanuts, rice cereal and maybe a version of your vegan caramel sauce – drizzled with melted chocolate. I am just tired of buying my kids protein bars from the store. Wish me luck! Thanks for all your great ideas! Wow what a great idea! Will you please let me know how it turns out? I just made these, but added some shredded coconut so that I can kill yet another craving in one shot. How yummy! Of course my 3 yr old was angry and said that I ‘ruined them’ with the coconut, though she liked coconut just fine until today, but I guess that means another batch very soon. (After I purchase a new processor, as I killed my ninja just now. NOOOOOO!) I think I would use less cocoa powder next time though, as they border on too bitter for my usual liking, but easily fixed and the recipe you have here is awesome. I can’t wait to try the original with chickpeas as they are a huge staple in our home. Thank u! Hi Cathy! I’m sorry I don’t have those calculations for you. Hi Maryea. I just copied this recipe & can’t wait to try it. It’ll help me use up all the black beans & P. butter I get from the food bank & give me something delicious & healthy as well. Thank You. 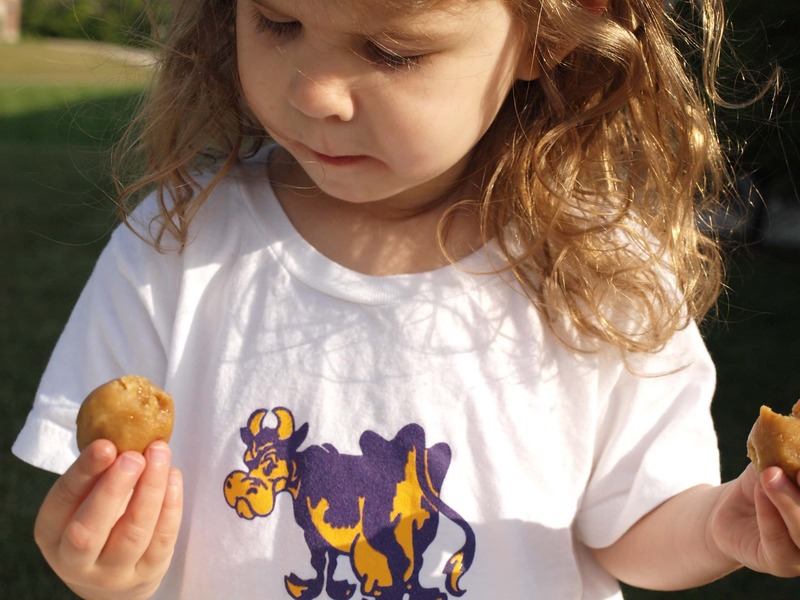 I’m going to try the Chickpea P. Butter Balls too! I’ve played around with this recipe (honey amount or using sweetened cocoa powder – hubby likes things sweet) and we really love always it. The other day I made it as written Just Cause and was shocked how deliciously and CHOCOLATY it was! Might just make as written from now on. I asked hubby to taste and he didn’t think the original recipe needed any additional sweetening either. We didn’t find it bitter at all (though we like dark chocolate…) and it really tastes like chocolate and the texture is much preferred to the grainy/chewy/lumpy texture of many ball recipes. Yes, frozen berries work as well!